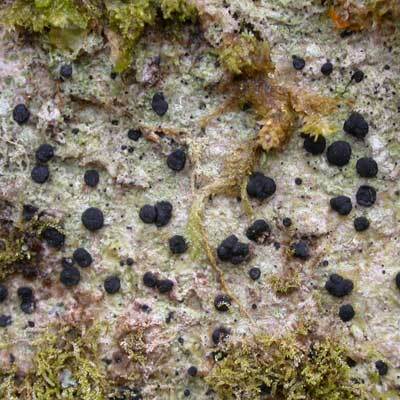 The large, black, thick-margined, convex discs belonging to this species may resemble those of Bacidia, Lecidea or Cresponea … but on the basic-bark of an ash or a maple? Look again. 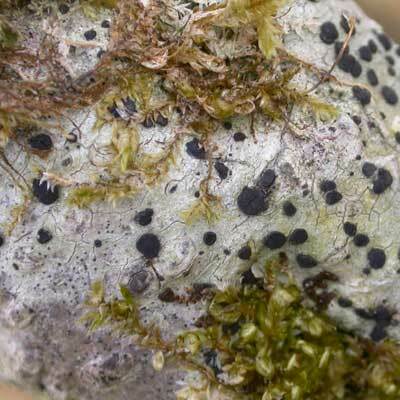 This time you see that the thallus is pale, grey or whitish, non-sorediate, non-isidiate. The discs are large (to 2mm diam.) with shiny raised margins. By a process of elimination you can identify this Megalaria in the field. For further confirmation cut a section through the disc and mount in K. Look at it under a microscope where the large, slightly waisted one-septate spores (20-30 x 8-15ųm) will be seen. Spot tests negative. Western Ireland. Mostly in older woodland or large trees in sheltered river valleys. Simms, M. J., (2016). Megalaria grossa (Pers. ex Nyl.) Hafellner. [In] LichenIreland.